Talisman From the Arabic 'tilasm', ultimately from the Greek 'telesma' or 'talein' (which means to initiate into the mysteries), a talisman consists of any object intended to bring good luck and/or protection to its owner. It is an object believed to be charmed or imbued with magical powers, normally used to ward off evil. However, the purpose of a talisman is not simply to protect or to bring good fortune, but to achieve a particular objective. When unsuccessful in achieving its desired goal, the talisman is discarded, since it has proved itself not to have the powers required. See also Amulet. Talmud This is more or less a term for the Mishna and Gemara when they are considered as one unit. Mishna derives from 'to repeat', and nowadays incorporates the meanings 'to learn' or 'to teach' by repetition. The Mishna came into being basically because the Jewish oral law was too vast for any person to remember. Gemara is basically an extension of the oral law and contains complete transcripts in question and answer format enlarging upon the Mishna. Tanakh The Jewish Holy Scriptures. Tanakh is an acronym of the first Hebrew letter of each of the Masoretic Text's three traditional subdivisions: Torah ('Teaching', also known as the Five Books of Moses), Nevi'im ('Prophets') and Ketuvim ('Writings') - hence TaNaKh. Taromancy Divination by Tarot cards. Tarot The earliest known extant specimens of Tarot cards are three decks of North Italian origin dating back to the early to mid-fifteenth century, and made for the then rulers of Milan, the Visconti family. The Tarot is a deck of seventy-eight cards used for divination and meditation purposes, comprising the Major Arcana, consisting of twenty-two trump cards (or twenty-one plus 'The Fool'), and the Minor Arcana, consisting of fifty-six 'suit cards'. 'Arcana' is the plural form of the Latin word 'arcanum', its meaning being 'closed' or 'secret'. Like a standard deck of playing cards, there are four suits in the Minor Arcana, each consisting of ten cards numbered from Ace to ten, traditionally batons (wands), cups, swords and coins (pentacles) - forty cards in total. The difference between the Tarot and a normal deck of cards, apart from the Major Arcana, is that a Tarot deck has four court cards (or honours) in each suit. Instead of Jack, Queen and King we find Page, Knight, Queen and King, thus sixteen court cards as opposed to twelve. Tasseomancy Tasseomancy is a form of divination or fortune telling in which the diviner interprets patterns seen in tea leaves at the bottom of a teacup. The term also refers to the reading of coffee grounds, particularly in the Middle Eastern tradition. Tau The twenty-second and final letter of the Sacred Alphabet. It literally means cross, has the phonetic value of T or Th, and has a numerical value of 400. It is further attributed to the Planet Saturn and the Tarot Trump The Universe. Taurus Taurus, the Bull, is an earth sign and the second sign of the zodiac. Taurus is ruled by the 'planet' Venus. Telepathy Telepathy is the communication between minds by means other than normal sensory channels, i.e. the transference of thought without the use of speech, gestures or other physical means. F.W.H. Myers (a co-founder of the Society for Psychical Research) coined the term ‘telepathy’ during his research into the possibilities of thought transference. He defined it as ‘transmission of thought independently of the recognised channels of sense’. Telepathy could be described as mind-to-mind communication, a means of obtaining the mental state or thought of another person existing in the 'here' or 'hereafter'. Temura Temura is basically permutation, using the Sacred Alphabet, which follows certain rules. One letter is substituted for another letter in the alphabet, and thus from one word another may be formed. Teth The ninth letter of the Sacred Alphabet. It literally means snake, has the phonetic value of T, and has a numerical value of 9. It is further attributed to the Zodiacal sign Leo and the Tarot Trump Strength. Tetractys The tetractys (from the Greek, tetras, meaning four) is an equilateral triangle containing the integers one to ten, aligned in four rows in the shape of a pyramid. The tetractys was devised by Pythagoras as a symbol of the Cosmos. Tetragrammaton The four-letter Tetragrammaton is supposed to be the true name of the God in the Hebrew scriptures. Its pronunciation is considered to have great power, and is never spoken aloud, except for once a year in the inner sanctuary of the Temple during Yom Kippur. The Tetragrammaton is central to the doctrines of both the Jewish and Kabbalistic traditions, where it is equivalent to the four worlds of creation, the four elements, the four archangels, and the four cardinal directions. See also Shem ha-meforash. Theban Alphabet Theban was introduced to Wicca by its founder, Gerald Gardner, as a result of which the Theban alphabet is used almost exclusively by Wiccans as a substitution cipher to protect magical writings from prying eyes. Although it is sometimes referred to as the runes of Honorius, Theban is not a runic alphabet. It first appeared in print in 1531 in Henry Cornelius Agrippa's Third Book of Occult Philosophy, where it was ascribed to the legendary magus 'Honorius of Thebes'. Thelema Thelema, from the Greek, meaning 'will', is the embodiment of Aleister Crowley's doctrine of 'True Will', after François Rabelais (c 1494 - 1553), the French Catholic monk who envisioned an 'Abbey of Thelema' in his Adventures of Gargantua and Pantagruel. In 1920, Crowley, along with Leah Hirsig (the Scarlet Woman), founded the Abbey of Thelema in Cefalu, Sicily. Followers of Crowley are called Thelemites. Theosophy A theory of philosophy which believes that humans are capable of intuitive insight into the nature of God, which involves meditation using Yoga to gain wisdom and self-knowledge. The modern Theosophical Society was established by Madame Blavatsky in 1875 and continued by her protégé Annie Besant. Theurgy Kabbalah and Hermetic Magick are both theurgic practices. Theologically speaking, theurgy is divine intervention in human affairs, or the performance of miracles, for example, the harnessing of spiritual forces through ritual to cause transcendent spiritual change. Thoth In Egyptian mythology, Thoth, also known as Tahuti, Tehuti and Thot, was the ancient Egyptian God of writing, magick, and learning. He is credited with the creation of language, numbers, and the measurement of time, and is often depicted as the scribe of the Gods. Thoth is considered the patron of magicians and sages, and has been credited as the originator of the Tarot. Tikkun The process of restoration. Tikkun (book), a book of Torah scroll text, used when learning to chant Torah portions or for correct-fixed scribal calligraphy. Tohu and Tikkun: The two stages of Existence described in the Kabbalah of Isaac Luria. The initial Olam-World of Tohu-Chaos collapses, to be replaced by the World of Tikkun-Rectification; Tikkun olam, the popular Jewish concept of "mending the world", terminology derived from Isaac Luria, but applied more widely to ethical activism in contemporary society. Tiphareth Tiphareth is the sixth Sphere (Sephirah) of divine emanation according to Kabbalah. The word Tiphareth means beauty. See also The Sephiroth. 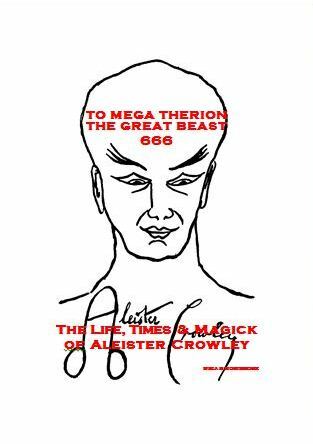 To Mega Therion One of several magical mottos used by Aleister Crowley. It stems from the Greek, meaning ‘The Great Beast’. Torah A Hebrew word meaning 'teaching', 'instruction', or 'law'. It is written in Hebrew (there are translations), the oldest Jewish language, and is the central and most important document of Judaism, revered by Jews through the ages. It is also known as the Law of Moses, primarily referring to the Pentateuch, the first five books of the Old Testament attributed to Moses. It is accepted that when Moses received the written law on Mount Sinai he also received the oral law, so the Torah includes both the written and oral law, which encompasses the entire spectrum of authoritative Jewish religious teachings. Tree of Life In the Book of Genesis, this is a tree whose fruit gives everlasting life, i.e. immortality. After eating of the Tree of Knowledge of good and evil, Adam and Eve were exiled from the Garden of Eden, after which God set angels to guard the entrance to the Garden fearing they would also eat of the Tree of Life and so become immortal. The Tree of Life is also the symbolic representation of Kabbalah, comprising the ten Sephiroth and the twenty-two paths of spiritual wisdom. It is a powerful means of gaining personal and spiritual realisation. Triangle of Art The Triangle of Art is the protected space outside the magick circle, into which spirits are compelled to appear in Solomonic Ritual Magic. The usual form is of a triangle, circumscribed with various words of power, containing an inner, blackened circle. The purpose of the triangle is to contain the manifested entity. The central circle is usually inscribed with the sigil (seal) of the spirit to be evoked. Tzaddi The eighteenth letter of the Sacred Alphabet. It literally means fishhook, has the phonetic value of TZ, TS, or S and has a numerical value of 90. It is further attributed to the zodiacal sign of Aquarius and the Tarot Trump The Star. When the letter Tzaddi is placed at the end of a word it is given a different character and a numerical value of 900.